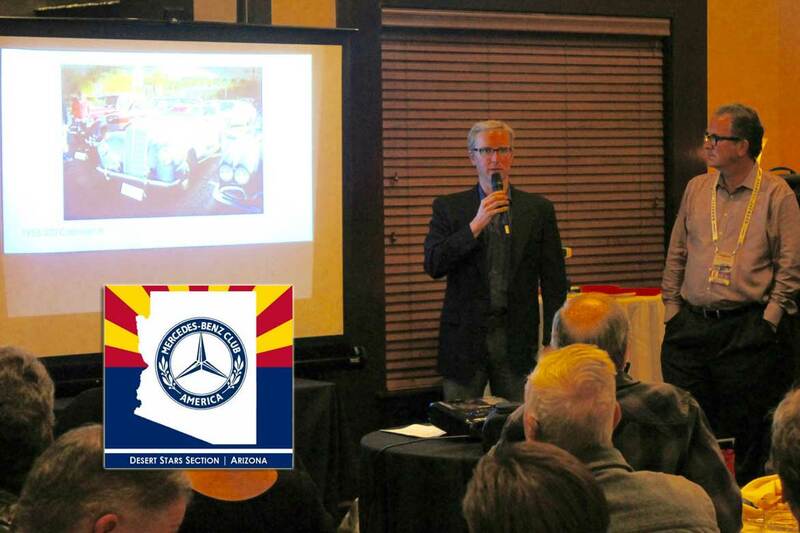 The nice folks in the Mercedes-Benz Club of America Desert Stars Section, covering Phoenix, Tucson and the surrounding areas of the southwest asked me to come back and be a guest speaker at their ‘Auction Week Dinner’ the Saturday night of ‘Auction Week’ in Scottsdale. Classic Cars Journal contributor and long time car guy, Andy Reid, joined me at the dinner to discuss some of the Mercedes-Benz cars we saw cross the various auction blocks during the week and answer questions from the crowd. 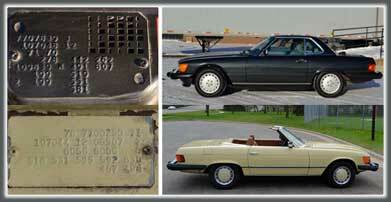 The ‘deal of the week’ in terms of Mercedes at auction. 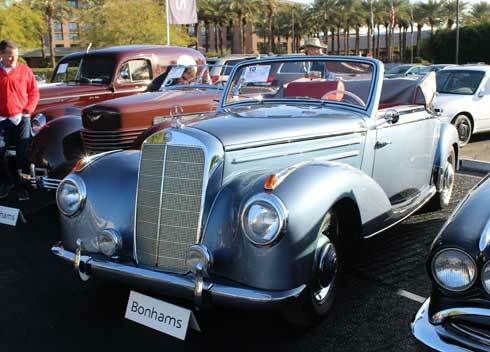 This 1953 220 Cabriolet A sold for $176,000 at Bonhams (Photo: Mark Ichiayama). I put together a group of cars I thought might be interesting to discuss before ever landing in Scottsdale. Desert Stars Section newsletter editor, Matt Crawford, photographed them at the various actions all week and arranged them in a cohesive PowerPoint presentation that was perfect. The group of about 8 cars I chose ended up being fairly indicative of the market with a couple of surprises. One car that sold well below what Andy and I both thought was a market price was the 1953 Mercedes 220 Cabriolet A that was offered at Bonhams. The pre-sale auction estimate for this car was $200,000 – $250,000, you can see more info about it in my Bonhams Auction Preview piece here. Complete with fitted luggage and detachable hard top, the only hard top I’ve ever seen for a 220 Cab A. I thought this very nicely presented 220 would fetch $225,000 and in my piece I wrote “I don’t think this car should have any trouble meeting its low estimate.” How wrong I was. On auction day the car sold for just $176,000. I looked the car over carefully. It was nicely restored, however the grey interior with red piping may not have been to everyone’s taste and probably wasn’t correct for this car. In any case, Andy and I both agreed that this might have been the Mercedes buy of the week. Fewer than 900 of these cars were built and they are gorgeous to look at and capable drivers with a 6 cylinder engine. 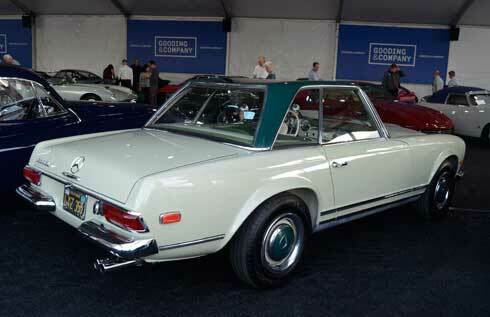 1968 250 SL soft top delete sold for $71,500 at Gooding and Co. Scottsdale. Another one of the cars we discussed, which I wrote a full feature on which you can read here, was the 1968 250 SL at Gooding and Company. A ‘soft top delete’ car that was nice looking in the unusual two tone color combination of Gray Beige (716 H) with Dark Green (268 H) hard top and wheel covers. Auction estimate was $125,000 – $150,000 which was wildly optimistic. My pre-sale prediction was that it would sell for $70,000. On auction day, it sold to a new owner, in the room, for $71,500. Andy and I both agreed that it was a market correct price for a nice, driver quality 250 SL with original sheet metal in today’s Pagoda SL market. 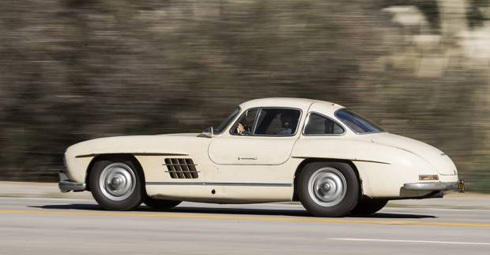 This 1954 300 SL Gullwing sold for $1,155,000 on teh second day of the Gooding and Co. auction. 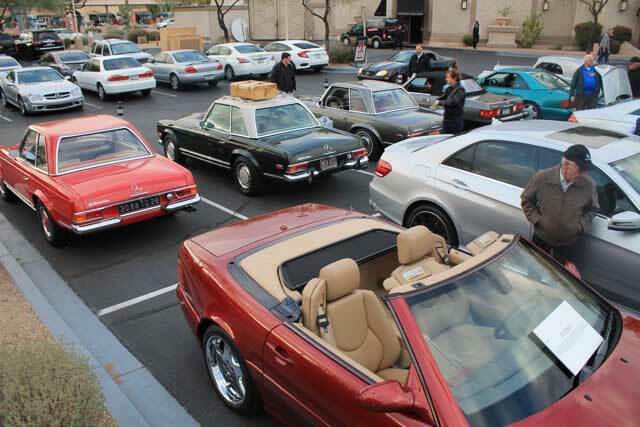 We talked about a handful of 300 SLs that were in Scottsdale this year. Interestingly, Gooding and Company was offering five of the seven 300 SLs available at all the auctions in Scottsdale this year. The only ‘barn find’ type 300 SL available this year was a 1954 Gullwing that sold on the second day of the Gooding and Co. sale (Read about all the cars offered on the second day of the Gooding sale with our sale predictions here). Their pre sale estimate was $1,100,000 – $1,300,000 which, while aggressive, wasn’t overly so. As noted in my presentation Saturday night, the final sale price of $1,155,000 was reasonable and market correct in today’s market. 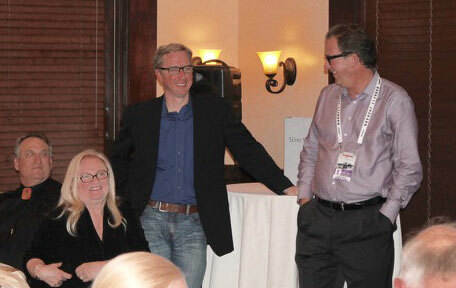 Dave Tobin and Andy Reid speak at the MBCA Desert Stars Auction Week Car Show and Dinner event in Scottsdale, AZ – January 2018 (Photo: Bud Clonninger). Andy and I both came to similar conclusions after watching and analyzing the Mercedes market and overall collector car market over the course of the week of auctions in Scottsdale. The market has settled into a ‘new normal’ after the high tide of 2014 and 2015. It’s really taken this long for sellers (more than buyers) to accept the fact that the prices that were being realized for most cars just a couple of years ago are no longer realistic. The correction that took place during 2016, continuing into 2017, has settled in and now collectors and dealers have adjusted and accepted the new reality. 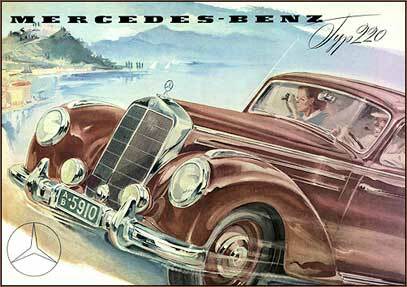 Remember though, while prices have pulled back, between 10 and 25% depending upon the car, in some cases, even more, many Mercedes models are worth twice (or more!) what they were in say, 2010 or 2012. That includes 190 SLs, Pagoda SLs and a bunch of coupes and convertible models. Long term owners can still be happy that their cars’ increasing values have helped defray the cost of their old car habit. The MBCA Desert Stars put on this Car Show and Dinner every year in Scottsdale, on the Saturday night of ‘Auction Week’. Any MBCA member from around the country is welcome (Photo: Bud Clonninger).